SoftPLC offers this low cost, distributed I/O product line, which we call the "S Series". The S-Series modules can be used with any controller or computer with ModbusTCP or Modbus RTU master capability. 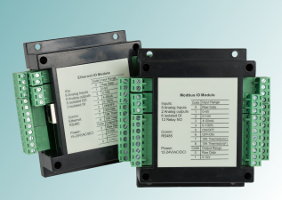 S-Series modules are the best value for reliable, industrial modular ModbusTCP or Modbus I/O. All S-Series modules are industrially rated, provide lightning and surge protection, and are panel or DIN rail mountable. The S-Series modules provide extremely cost-effective protection and conditioning for a wide range of industrial control signals and systems. These modules are ideal when you have only a few I/O points, or need to distribute a small number of I/O points in several locations and you don't want to incur the overhead/cabling cost of a fieldbus network (eg: Profibus or DeviceNet). Applications include HVAC or building automation controls, data acquisition, security systems, energy management, test stands, process monitoring, sorting conveyors, utilities, and remote installations. S-Series I/O modules are a family of compact and networkable data acquisition and control modules, with a wide range of available analog and digital input/output signal types. All modules are designed for reliable operation in harsh environments and are equipped with isolation and failure protection, and high resistance against noise-interference. Most modules support both ModbusTCP via Ethernet and ModbusRTU serial via RS-485, the industry's most widely used bi-directional, balanced transmission line standard. Configuration and troubleshooting information for the high performance Modbus Serial Master driver for SoftPLC. The COMGENIUS loadble instructions can be also used for simple Modbus Master requirements. SoftPLC's ModbusTCP Master Driver supports most modbus commands on TCP/IP and UDP/IP. Can be used with S-Series modules I/O that support ModbusTCP.